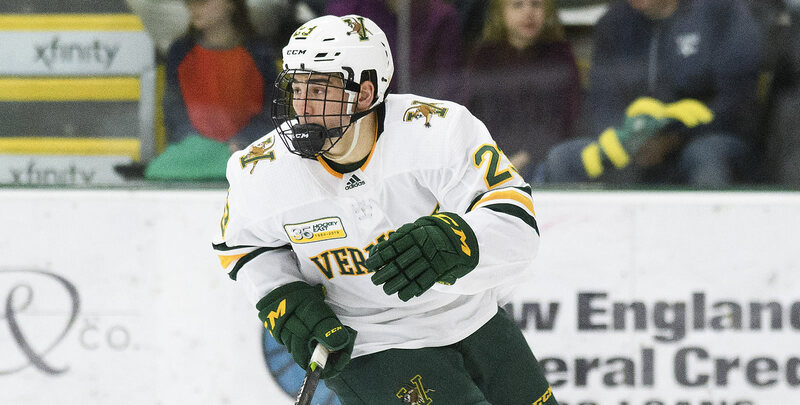 BURLINGTON, Vt. - Sophomore Max Kaufman capped a thriller at Gutterson Fieldhouse with an overtime winner at 3:40 of the extra period to lift the Vermont Catamounts to a 4-3 victory over the Merrimack Warriors on Saturday. "We got a little bit undisciplined with the major. We had the game in our hands, essentially at 3-1, so that was disappointing but give our guys a lot of credit for not getting too down going into overtime with a mindset to win," head coach Kevin Sneddon said. "We've seen that kind of game go against us one too many times this year so from a morale standpoint, that's a big two points for us, a big four-point weekend." - Alex Esposito opened the scoring at 8:05 of the first period as Merrimack goalie Logan Halladay misplayed a dump from Catamount junior Jake Massie. Esposito picked up the loose puck in the Warrior zone and fired a shot into the open net for the 1-0 lead. - Vlad Dzhioshvili doubled the Vermont lead just 1:27 later as he backhanded a rebound past Halladay from the slot. Bryce Misley took the initial shot to pick up the assist and Conor O'Neil grabbed the secondary helper. - Captain Derek Lodermeier muscled the puck past Halladay with a Merrimack defenseman draped over him along the goal line halfway through the second period, but the call on the ice was no goal, and following the third video review of the frame, the call was upheld. - Merrimack's Tyler Irvine hit the back of the net at 13:17 of the second period following a chaotic stretch in the Vermont slot to cut into the Catamount lead. Alex Carle's initial shot was blocked by Carter Long as Merrimack's power play expired, but Irvine managed to fire the loose puck past a diving Lekkas. - Jake Massie found the back of the net from the blue line to make it 3-1 Vermont on an extended Catamount power play as Merrimack's Logan Drevitch picked up a major kneeing penalty halfway through the third. Liam Coughlin and Esposito assisted on the power play tally. - Following a major kneeing call against Joey Cipollone, Merrimack scored with 4:55 remaining in the third to make it 3-2 before Sami Tavernier tied the game with ten seconds left in regulation. - In the overtime period, Lodermeier won an offensive zone faceoff towards Kaufman in the slot. The sophomore fired a shot past a surprised Halladay to give Vermont the 4-3 victory and sweep over Merrimack. - UVM was 1-for-4 on power play chances as Massie struck on the extended advantage in the third period. MC was 2-for-5 on the power play, tying the game on its extended advantage late in the third period. - Lodermeier was 18-for-23 on faceoffs Saturday night, winning the most important draw to end the game. Over the weekend, Lodermeier was 31-for-40 at the dot for a 77.5% success rate. - Stefanos Lekkas made 28 saves in the victory for the Catamounts. Halladay made 34 saves for Merrimack in the OT loss. - Vermont has now swept Merrimack in two straight seasons. The Cats took a pair of wins over the Warriors last season in North Andover, Massachusetts, including one in overtime. - With the victory, the Cats Win, Community Wins campaign and Vermont Mutual Insurance Group will donate $100 to Make-A-Wish Vermont; bringing this year's total to 18 wins and $1,800. Vermont returns to the road and travels to Schneider Arena for a Hockey East series against 14th-ranked Providence. The games are slated to begin at 7:05 p.m. on both Friday (Feb. 1) and Saturday (Feb. 2). Saturday's game will air on NBCSN Boston.